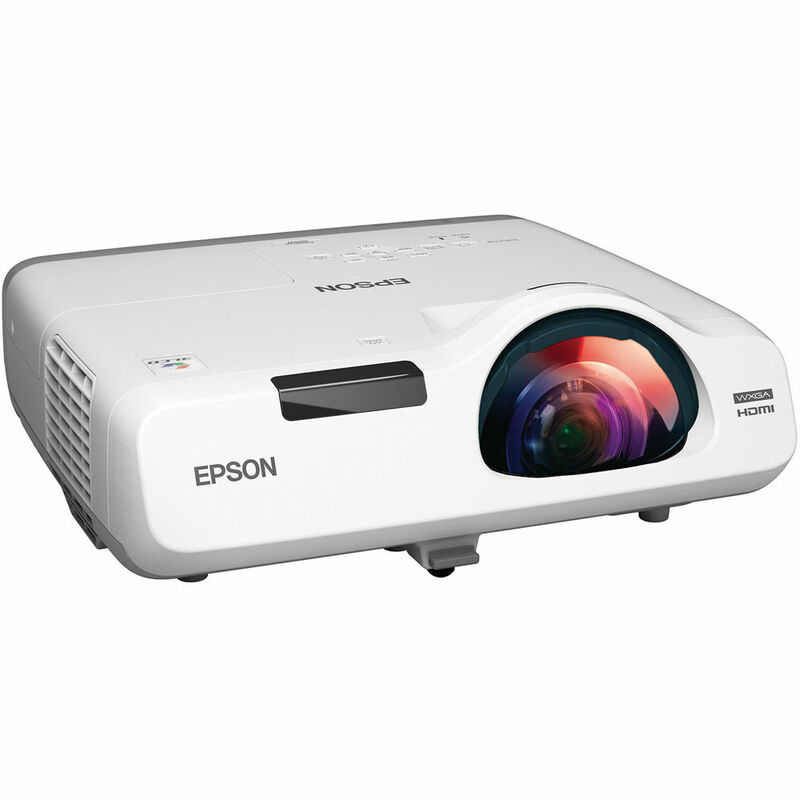 The short-throw Epson PowerLite 525W 3LCD Projector is ideal for classroom settings, rear projection, and other installations where the projector needs to be placed very close to the screen. For example, with a 28" throw distance, it will produce a 106"-diagonal image. The 3LCD imaging device features a WXGA (1280 x 800) native resolution, and is backed up by a lamp producing a brightness of 2800 lumens in its brightest setting. In addition to WXGA, the projector can scale a range of non-native resolutions from SD (480p) up to UXGA (1600 x 1200). For direct connection to computers with analog outputs or integration with many AV systems, there are two VGA inputs plus a single VGA output to loop-through the selected VGA input to a local monitor or other secondary display. For connection to digital and HDTV devices there is an HDMI input, and for legacy SD equipment there is a composite input and an S-video input. In addition, an Ethernet port means up to 50 devices sharing the same network as the projector can be connected, and images from up to four of those devices can be shown on-screen at once. Two USB ports allow the projector to be used standalone, projecting off of a USB storage device or for connecting it to a document camera or computer. One of the ports can also be used with an optional dongle (available separately) that enables wireless (Wi-Fi) network connectivity - including projection from a mobile app. In addition to device connection, the Ethernet port allows the projector to be managed remotely - which helps reduce IT administration costs by enabling centralized control. A CD with management software is included. Additionally, RS-232 allows you to integrate the projector with automation systems such as Crestron. Finally, an IR remote is included for local control of the projector. When connected to a computer through USB, the remote can also serve as a presentation mouse - for example, by changing slides in PowerPoint documents. Box Dimensions (LxWxH) 19.0 x 15.0 x 8.0"